As The Curmudgeon eagerly awaits the arrival of the University of Michigan's offense, he regales himself with tales from the internet. Here are Friday's links. U.S. unemployment has dropped below 6% for the first time since before the Bush Great Recession. The September jobs report shows strong growth with 248,000 jobs added and the unemployment rate dropping to 5.9%. The BLS also revised August jobs growth upward from 142,000 to 180,000 new jobs. Gov. Rick Snyder acknowledged Monday that his proposed cut in K-12 funding is "difficult" for local school districts, but denied it is an attempt to break the unions. That's the lede from a report on mLive back in March, 2011. Snyder said Monday that he is proposing to cut K-12 funding to bring state spending in live with revenues. "It's being fiscally responsible," he said. Snyder admitted to the $1-billion in cuts in an interview with the Kalamazoo Gazette on March 21, 2011. And just yesterday the local news in Lansing ran another story about declining funding for schools. The superintendent of suburban Grand Ledge schools told WLNS TV his district's state support has declined by about $2-million every year since Rick Snyder took office. Some of that is attributed to declining enrollments (thank you, for-profit charter schools for diverting students) and the rest results from state cuts in K-12 funding. Gary Peters Dominating "Silent Terri Lynn"
Peters holds a nine-point lead of Land in the latest EPIC/MRA poll. Significantly, 14% of voters surveyed remain undecided in the race. that Land's level of support – 33% – is about the same size as the Republican base. That is reflected in her massive 46% unfavorable rating (up from 34% in July); Peters unfavorables are at 30% which means not even all hard-core Republicans disapprove of him. 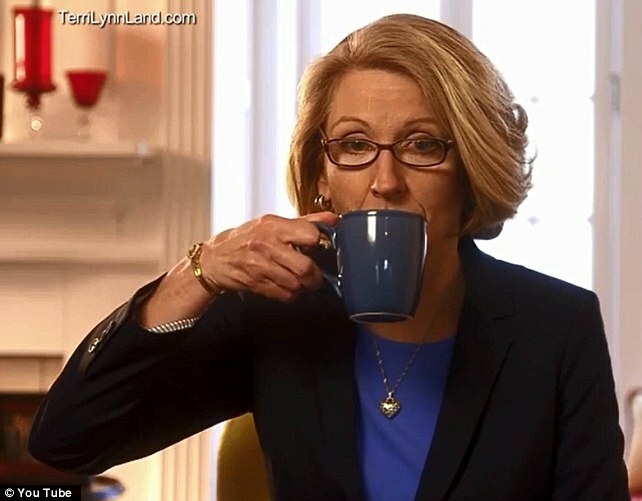 Peters' lead is due in large part to a 12% lead among women (remember the "Silent Terri" coffee cup ad?). While most of the media attention involving Michigan politics centers on the gubernatorial and senate races, there are also 14 races for Congress. Very quietly Ingham County Treasurer Eric Schertzing is making progress in turning the 8th district (current home of Mike Rogers) from red to blue. Republicans have obliged him with an opponent that makes people cringe: onetime state Senate obstructionist-in-chief Mike Bishop. Schertzing is now on the air with his first TV ad, and it hones in on Bishop's horrid record on education, and his role in twice shutting down Michigan government. Helping Schertzing: immediately above him on the ticket is Gary Peters, and Peters has a double-digit lead over Land in Oakland County which is Bishop's base, and the largest part of the 8th district. 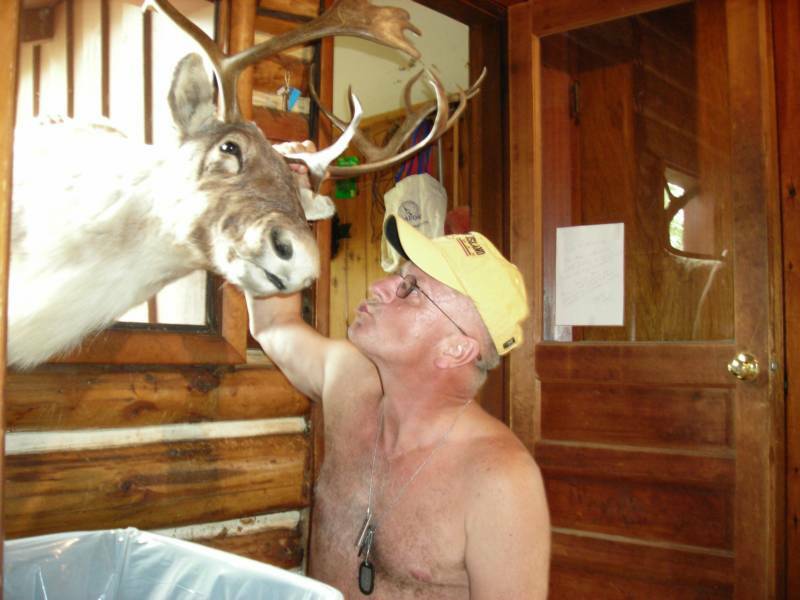 And now we get the word that Mike Bishop's life has become a little more challenging: Kerry Bentivolio, affectionately known to Democrats as KooKoo Kerry, is running as a write-in candidate in the congressional race. He knows he won't win, but he figures by running he can help increase the turnout for "Silent Terri Lynn" Land. And he admits he's pissed at the GOP establishment for the way they dumped him in favor of the Foreclosure King, David Trott. Saying he's been contact by about 1,600 people who say they won't vote if he isn't running, Bentivolio figures he'll get up to 2% of the vote. If turnout is comparable to 2010 (a lower turnout year) that would translate to about 4,750 votes. You can bet those aren't folks who would be voting for Eric Schertzing. A Texas federal appeals court has given the OK to a Texas law that will shut down all but seven women's health clinics in the state which offer abortions. Two years ago there were 40 facilities available for women who wanted to exercise their constitutional right of choice. Now they still have a choice, but it can involved traveling hundreds of miles and substantially higher costs. Pro-choice advocates say one-million Texas women live more than three hours drive-time from a clinic. The Texas law affirms the idea that the same people who rail against any restrictions on their constitutional rights when it comes to guns have no problem with trampling the constitutional rights of women. "Constitutional government" is, by their definition, defending those rights which you support and to Hell with the rest. Washington Post columnist Paul Waldman writes "If the ruling holds, before long abortion could become all but illegal in nearly every state controlled by Republicans"
Why is this relevant in Michigan? You can count on Right to Life demanding the lame duck Legislature enact laws similar to those in Texas, laws which require doctors performing abortions to obtain hospital admitting privileges, as well as stringent new requirements for the facilities. The Michigan House Democrats introduced a package of bills today aimed at enforcing accountability and transparency in the state contract process. The legislation was introduced following several reports of fraud and abuse by Aramark, a private company under contract with the state to provide food services in Michigan prisons. Aramark took over food services less than a year ago, but in that time has already amassed a catalog of safety violations, food shortages, record fines and even murder for hire − because of its shoddy business practices. Aramark’s dismal performance in Michigan was preceded by similar negative results in Florida, Kentucky and Ohio, with Florida finally terminating its contract with Aramark. HB 5889 (Faris) – Requires state agencies to submit a detailed cost-benefit analysis to the House and Senate Appropriations committees before seeking approval from the Civil Service Commission for privatization that replaces state employees. HB 5890 (Rep. Marcia Hovey-Wright, D-Muskegon) – Requires a state agency to submit a detailed economic impact study to the House and Senate Appropriations committees before seeking approval from the Civil Service Commission for privatization. The impact study would look at estimated effects on the local community where the privatization would occur. HB 5891 (Rep. John Kivela, D-Marquette) – Requires state contracts to include metrics and parameters that vendors must meet, and allows the state to cancel contracts if the vendor fails to do so. HB 5892 (Rep. Andrew J. Kandrevas, D-Southgate) – States that if a state agency enters into a contract that exceeds $500,000 in any year, the contract shall require that the vendor provide records related to the performance of the governmental function to the appropriate state agency. House Bill 5893 (Durhal) – Adds “the number of full-time jobs and part-time jobs and the wage rate for those jobs that will be maintained or created with the expenditure of state funds” to a list of current requirements state agencies must provide to the Department of Technology, Management and Budget (DTMB). HB 5894 (Rep. Woodrow Stanley, D-Flint) – Provides that state contracts will not be awarded automatic renewal. HB 5895 (Rep. Sam Singh, D-East Lansing) – Forbids a vendor from participating in the bid process, or from being awarded a contract, unless it is in compliance with all local, state and federal laws and regulations. Barring action on global climate change, Michigan's climate could warm to the point of being comparable to Kentucky over the next century. Our average temperature of 44.8 degrees will climb nearly 10 degrees. OK. So most of us will be gone in 2114. 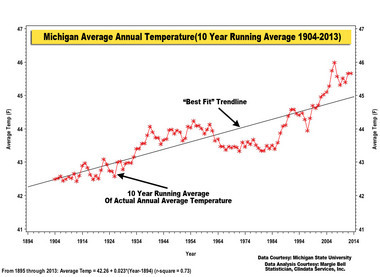 The mLive.com report sees a jump of 3.2 degrees in the average temperature in the next 25 years. That's enough to completely disrupt Michigan agriculture, increase our exposure to insects, increase the number of catastrophic forest fires, add to inland lake pollution due to warmer waters, and change the fish population of everything from the Great Lakes to the smallest inland lake. ll in the name of short-term profits. One of the most consistent and galling lies from the GOP and its media outlets is that the Obama economic policy is a failure. In a speech yesterday, the President very clearly ... AND FACTUALLY ... detailed why America is much better off today than when he took office nearly six years ago. The theory behind The Big Lie is that if you say something often enough and loud enough, people will believe it. Republicans have taken The Big Lie to heart and, in The Curmudgeon's view, that is the primary reason behind Obama's negative job ratings. Look at the charts, look at the facts, and fight fiction with truth. We are much stronger economically today than we were when W and Cheney were calling the shots. The impact of the "sequestration" - those across-the-board 5% budget cuts embraced by Ryan and his buddies on the right as a great way to right-size government - is having a more visible impact every day. The sequestration ripped $1.55 billion from the budget of the National Institutes for Health (which includes the Center for Disease Control.) Anthony Fauci of NIH told Congress earlier this week "it's been a significant impact on us. It has both in an acute and a chronic, insidious way eroded our ability to respond..."
Meanwhile, in the aftermath of the White House security crisis, we learn that the U.S. Secret Service is short-staffed to the tune of about 500 agents. This interview, from the PBS Newshour, details how budget cuts (thanks, Paul Ryan!) have contributed to security breaches.